Abu Dhabi-based Masdar has announced the official launch of the 8,400-sq-m Graphene Engineering Innovation Centre (GEIC) building at University of Manchester in UK. Designed by architect Rafael Vinoly, it is located on the university’s North Campus. Masdar is the principal financier of the purpose-built facility which was unveiled on December 11 at a special ceremony by HRH Prince Andrew, Duke of York. Also attending the opening were Rawdha Al Otaiba, deputy head of mission of the UAE Mission; Dr. Nawal Al Hosany, the permanent representative of the UAE at the International Renewable Energy Agency (Irena) and Dr Steve Griffiths, the senior vice president for research and development and Professor of Practice at Khalifa University of Science and Technology. Hailing the official opening of the Masdar Building, the Abu Dhabi Future Energy Company said it was an important step forward in its commitment to advancing clean-tech innovation around the world. 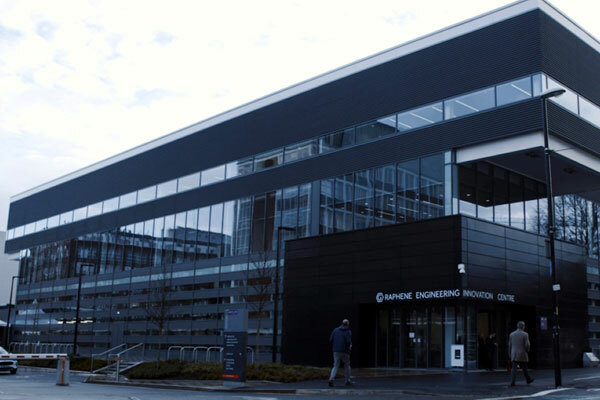 The GEIC building will house pilot production facilities and conduct research into other advanced materials, as well as graphene. Stronger than steel, thinner than paper and highly flexible, graphene was first isolated by University of Manchester scientists, Andre Geim and Konstantin Novoselov, who were jointly awarded the Nobel Prize in Physics in 2010 for their ground-breaking experiments to characterise the material. Graphene’s unique properties could be used for a range of applications in the future, including energy storage solutions, water purification technology, lightweight aeroplanes, mobile phones, and even clothing. Thanking the university and all the funding partners, Masdar CEO Mohamed Jameel Al Ramahi said: "The Masdar Building reflects our combined efforts to incubate technologies that will unlock clean energy solutions and sustainable development globally." "Our partnership with The University of Manchester, and the Khalifa University of Science and Technology, represents a journey of innovation and discovery to transform graphene into real-world, commercially viable solutions," he noted. Scientists from the Khalifa University of Science and Technology and The University of Manchester have been pursuing a number of Research and Development projects in graphene, said a statement from Masdar. "These include developing 3D printed foams for the aerospace and robotics industries; using graphene sheets to enhance water treatment and desalination technologies, and producing graphene-based inks as micro-sensors for energy and other industry applications," he stated. "The centre supports the business strategy of Masdar to participate in advanced clean technologies as soon as they show commercial potential," Al Ramahi added. Over the past 10 years, Masdar has invested in a number of renewable energy projects in the UK, including London Array, one of the world’s largest offshore wind farms, which marked five years of operations this year; the 402-megawatt Dudgeon offshore wind farm, launched last November; and Hywind Scotland, the world’s first commercial-scale floating wind farm. In May this year, Masdar announced the connection of the smart battery solution Batwind to Hywind Scotland, the first energy storage facility of its type linked to an offshore wind project.